Should states support pregnant teens and their babies? ANN ARBOR, Mich. – The majority of U.S. adults who have children 18 or under agree that state support for pregnant teens is a good investment for the baby's health, a new national poll suggests. But most want to see teens meet certain criteria — including taking parenting classes and graduating high school — in order to receive assistance. Nine in 10 adults also say that states should do more to require financial support from the baby's father, but only half support their state providing paternity testing or legal help to get child support, according to the C.S. Mott Children's Hospital National Poll on Children's Health at the University of Michigan. The report is based on 2,005 responses from a nationally representative sample of adults with children 0 to 18. "Teen pregnancy can lead to unexpected challenges that many families may not be able to meet on their own." Clark says. "The adults we polled are parents themselves; they prioritize the health of the pregnant teen and the baby and recognize that the cost of raising a child is substantial. 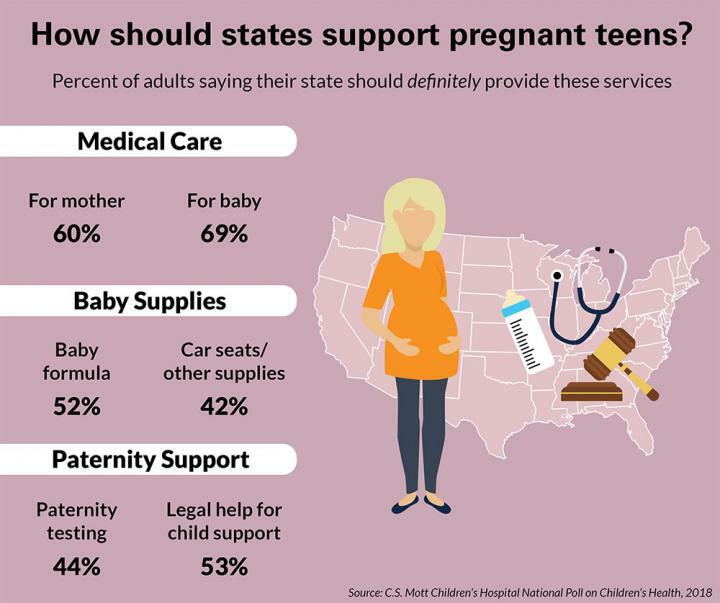 The majority agree that the state has a role in supporting pregnant teens but are hesitant about assigning broad responsibility to the state." Most adults expressed a strong belief in health-related support for pregnant teens and their babies. But adults were less certain on whether their state should provide formula (52 percent) or car seats and other baby supplies (42 percent). Women were more likely than men to believe the state should provide medical care, formula and baby supplies for pregnant teens. Fifty-six percent of adults agreed that when a teen gets pregnant, her parents should be financially responsible. Thirty percent of adults said community and religious groups, not the state, should take care of pregnant teens. Although 90 percent of adults agreed that states should do more to require financial support from the baby's father, fewer felt their state definitely should provide legal help to get child support (53 percent) or paternity testing (44 percent.) Women and men expressed comparable support for state assistance with paternity testing. But women were more likely than men to believe their state should provide legal help for pregnant teens to get child support. "We saw a strong endorsement among respondents that states should do more to require financial support from the baby's father. At the same time, there was lukewarm support for states assisting with paternity testing and establishing child support," Clark says. Overall, women were more likely to support strategies to support pregnant teens than fathers. Clark notes that this may reflect their recognition that in many cases, it is the teen mother — not the father — who pays the financial, emotional and social cost of having a baby. Assistance around paternity testing and child support may be particularly critical for teens, who likely are unfamiliar with the terminology, testing processes and legal requirements, Clark adds. Twice as many adults felt their state definitely should provide adoption services (61 percent) compared with abortion services (26 percent). The vast majority of adults also believed that pregnant teens should meet certain requirements in order to receive state support, including attending prenatal visits (90 percent), parenting classes (88 percent), drug testing (85 percent) and finishing high school (78 percent). Seventy percent of adults felt that pregnant teens should meet all four requirements in order to receive state support. Clark says that while such requirements may be well-intentioned to help make teens more responsible, they could become problematic when teens fail to meet them. Teens may face logistical barriers, such as not having transportation to prenatal visits, or a lack of affordable daycare while a teen mother tries to finish high school. "A thoughtful approach to implementing requirements for pregnant teens would be essential so that the consequences for failure to meet the requirements do not undercut their intended health and educational benefits," Clark says.